CFML (or probably LuceeLang) and what constitutes "The Truth"
This all stems from a Jira ticket for Lucee: "Redefining truthy and falsey values (LDEV-449)". The way the ticket is worded means it's not convenient to copy and paste a chunk of its detail to explain the gist of it, so I'll reiterate. There are other coercions that will feed into these, for example strings with numeric values - eg: "42" (as opposed to just 42) - will happily coerce into a numeric, then from there to a boolean. What this ticket is about is extending this to have a notion of "truthy" and "falsy" for other values and other data types. This notion stems from Groovy (and perhaps other languages) which is pretty liberal with what it will consider truthy or falsy. These terms "truthy" and "falsy" denote the values are not actually boolean, but will pass / fail a boolean check. println " " ? "truthy" : "falsy"
println "" ? "truthy" : "falsy"
println 0 ? "truthy" : "falsy"
println new Test("truthy") ? "truthy" : "falsy"
println new Test("anything else") ? "truthy" : "falsy"
So all the common data types, and indeed custom data types have a sense of truthiness (and, by inversion: falsiness). This is the gist of the ticket. Basically... checking for emptiness in an object (irrespective of what the definition of "empty" is), is a very very common requirement, and this truthiness concept just gives the ability to abbreviate that via some synatactic sugar and an agreed-on method of identifying what it is to be empty, and fielding that as a boolean: empty is "falsy", and not-empty is "truthy". There's been some kick-back on it by people who don't seem to understand the concept of "syntactic sugar" and simply "don't get" the ticket. I'll leave it to you to read their comments and form your own opinion. Any class that implements that method can then have its objects used in boolean expressions. Basically they need to implement something like a BooleanBehaviour interface. Obviously my class there doesn't implement any interfaces, but I have not got far enough into Groovy to know whether interface implementation is just fulfilled by behaviour, rather than by contract (like it is in CFML). I think it's essential for Lucee's implemention of this to follow an approach like this. Not just to bung some behaviour in to allow its current types to magically behave like booleans, but implement it in a formal fashion. And also expose the same interface to both Lucee users' .lucee code, but Java code too. The current ticket seems to be asking for this for Lucee's CFML implementation, but I think this is a mistake because some of the CFML's implementation's automatic coercion to boolean conflicts with the "truthy" approach. Most notably a string "0" in CFML is false, because it will be converted to a numeric, and 0 is false. But using sensible "truthy" behaviour for strings... "" is false, and any other string is true. It makes little sense (and violates POLA, IMO) to have "" and "0" as false, and [any other string] be true. It would just make CFML look like it "didn't quite get it" when it implemented this feature. Also note that Brad's narrative mentions toBoolean(), whereas Groovy's handling is asBoolean(). This might seem like a semantic difference, but I think it requires closer examination. Groovy has both toBoolean() and asBoolean(); and it looks like C# does too. Best LAS get this one right. At least understand the differences (which I don't, I have to say), before deciding how to approach. Sorry this article isn't so interesting. I started to percolate away at it during the week and reckon I got enough content for an article, but never really achieved any real nuance to it. Still: for something that started as a Jira comment I guess it's all right. It is not the place of a browser vendor to second-guess the materiel a website chooses to display. Especially when it means they replace that content with their own content. I know user-agent sniffing is frowned upon as a solution to this sort of thing, but generally this is because one should be detecting browser features, not the browsers themselves. In this case I actually want to specifically identify the browser, so it seems a reasonable - if not very thorough - approach. Obviously it's easy to circumvent, so do that if you like. Also if anyone gets redirected to here and they're not using Brave, lemme know. And you're entitled to disagree (or agree!) with my position on this, and you're more than welcome to put forward your case in the comments below. If someone makes a compelling case why I should stop doing this, I will. As it stands though: don't support this shittiness. 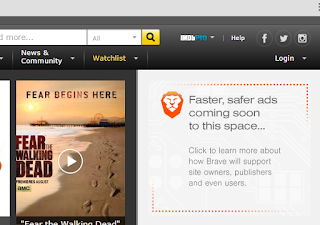 If you're seeing this page because you are a "Brave" user... consider changing your browser decision.